This Saturday and Sunday (May 12 and 13) have been designated National Mill Day when some 900 windmills all over the country open their doors to the public. To get you in the mood, here are some facts and figures about the Netherlands’ most enduring industrial monuments. The oldest remaining mill in the Netherlands is the Zeddam tower mill in the province of Gelderland. It is one of four remaining mills of its type. Built before 1451, it belonged to the ducal Van den Bergh family. Local farmers had no choice but to bring their grain to the mill, hence the name ‘dwangmolen’, or forced mill. During World War II, the mill was used by friend and foe alike: the Wehrmacht used it as a look-out post but it also sheltered local people who needed a safe house. Canadian soldiers left a radio transmitter in the attic which can still be seen today. 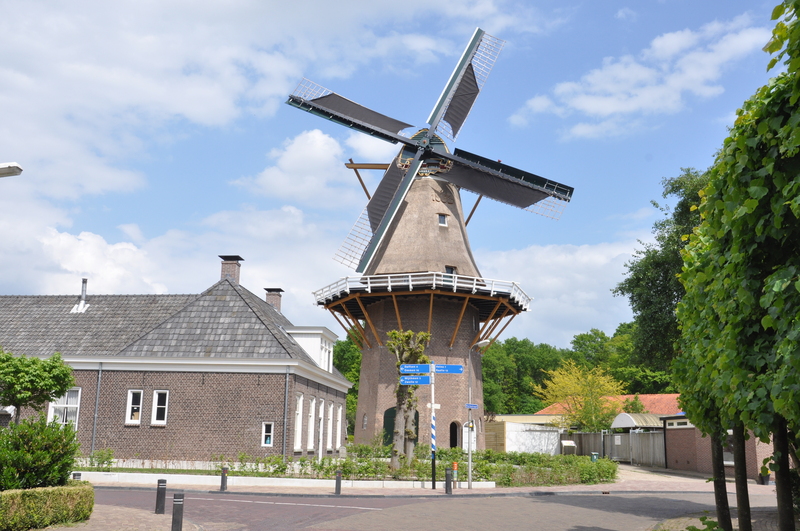 Molen de Noord in Schiedam is the highest classic windmill in the world. It stretches 33.3 metres into the sky and is one of 19 very tall corn windmills which serviced the city’s gin-making industry. In 2006 the Nolet distillery built a new ‘old’ windmill which is nine metres taller. What were windmills used for? The energy generated by wind and watermills was used to turn any raw material that needed pounding, mauling, shredding, hacking or mixing into a tradeable product. The Zaanstreek paper mills, for instance, were renowned throughout the world for their good quality paper. In fact, the American Declaration of Independence was printed on sheets produced there. There were mustard mills, hemp mills, grain mills, snuff mills, cocoa mills, oil mills, chalk mills, paint mills and saw mills. Because of their ability to turn trees into planks (for shipbuilding) much more quickly, the latter were instrumental in making the Netherlands a powerful and very rich sea-faring nation. In fact, some say the first industrial estate in the world was a complex of 23 saw mills on the Kostenverlorenkade in Amsterdam. One, the Otter, still remains. In the 18th century polder windmills, or drainage mills, were used for land reclamation. Do all mills look the same? No. The architecture of the Dutch mills is extremely varied. We’ll mention just a few types. The standerdmolen or post mill has been in use in the Netherlands since the 1200s. Its wooden body pivots on a post and can be turned to take full advantage of the wind. A good example is the Windlust post mill in Nistelrode. The stellingmolen or smock mill is found in cities. It had to be tall enough to catch the wind and has a high gallery from which to arrange the sails. De Gooyer in Amsterdam is a smock mill. A ‘grondzeiler’ is a smock mill whose sails nearly reach the ground. It is dangerous because people or animals could easily get ‘a klap van de molen’ (see Expressions). A typical example of a ‘grondzeiler’ is the Achlumer Molen in Achlum. The position of the sails on a windmill can be used to convey messages such as a death in the family, a joyous occasion such as a wedding, a short or a long time of inactivity or even a call to come to the mill as quickly as possible. Sail signals also warned locals against impending Nazi raids during World War II. Windmills abound in the paintings of the Golden Age. They could hardly be avoided: some nine thousand dotted the landscape in the 17th century. 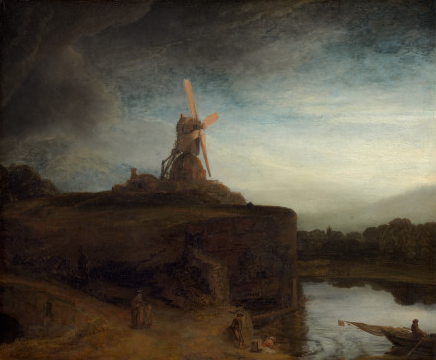 Rembrandt (a miller’s son) painted a powerful picture in which a windmill towers over the landscape, the sun lighting up its sails as black clouds recede. In 17th century paintings windmills usually weren’t simply windmills but symbols of strength. They kept the soil dry and the people safe. Rembrandt’s mill may also refer to the quiet of peace after the struggle for independence from Spain, according to the experts at the National Gallery of Art, Washington. 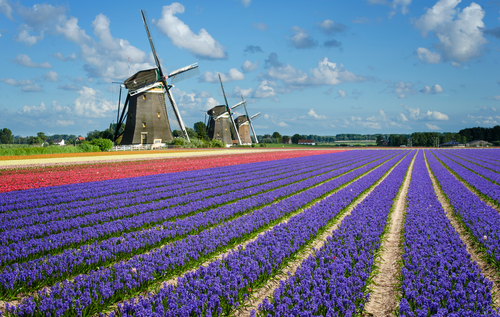 Windmills are emblematic of the Netherlands and it is no wonder they made their way into the Dutch language. ‘Met molentjes lopen’ (walking with windmills) means to be a little crazy as does ‘A klap van de molen hebben’ (to be hit by a sail). ‘Alle molenaars zijn geen dieven’ (not all millers are thieves) seems to imply that not all millers were found to be trustworthy either. There are 991 windmills, 397 drainage mills and 594 industrial and corn mills left in the Netherlands, according to Groningen University. The decline of the windmill set in with the discovery of steam power at the start of the industrial revolution. The Dutch polder boards were slow to adopt steam for their pumps – after all, old-fashioned wind power had kept Dutch feet dry for centuries. But eventually land reclamation on a large scale made the use of steam-powered pumps inevitable. A number of windmills were destroyed during World War II and many crumbled through neglect. Kinderdijk is one of the best-known places for windmill watching. Its 19 windmills, almost all ‘grondzeilers’, are on the UNESCO world heritage list. These mills, which pumped up the polder water, played an important part in shaping the Netherlands. The Zaanse Schans is another popular windmill destination. It has a collection of working saw mills, oil mills, a spice mill and many more historical monuments. Best avoided during the main tourist season. The Netherlands’ new windmills are wind turbines – there are currently some 3,000 wind turbines in action of which some 289 are situated off shore. Some 5% of Dutch electricity is now generated by wind power.